Shaw Stainless stocks a variety of pipe couplings. PVC couplings are of high quality, corrosion resistant and available in multiple sizes to fit your pipe coupling needs. Our PVC couplings are available in a variety of sizes to fit any piping configuration. We also carry an inventory of full couplings and reducing couplings. Our inventory includes: female threaded and socket regular, full and reducing couplings We can accommodate any need with our wide-ranging and hard to find sizes. Corrosion resistance for low pressure piping needs. We also carry a full line of stainless pipe fittings and other products. View an overview of our product offerings. View our PVC coupling product dimensions for reference. Please review our product dimensions to confirm your specifications. Various PVC coupling sizes to meet your piping specifications. This pipe chart can assist in your selection. PVC couplings conform to ASTM D-2464 & ASTM D-2467. View our standard specifications chart. View our stainless steel resource grade chart. It lists multiple applications for the many different Grades of stainless steel. View thousands of PVC, stainless steel and other alloy pipe products. 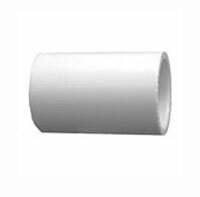 Our Reference Catalog identifies PVC pipe couplings and other pipe fittings through specification charts and illustrations. View our stainless steel pipe theoretical bursting pressures chart. PVC fitting temperature rating is 140°F. The PSI is based on water at 73°F. Derate 50% at 110°F and 78% at 140°F. PVC is not recommended for use in compressed air or gas systems.